The muskrat (Ondatra zibethicus), the only species in genus Ondatra, is a medium-sized semi-aquatic rodent native to North America, and introduced in parts of Europe, Asia, and South America. The muskrat is found in wetlands and is a very successful animal over a wide range of climates and habitats. It plays an important role in nature and is a resource of food and fur for humans, as well as being an introduced species in much of its present range. An adult muskrat is about 40 to 60 cm (16 to 24 inches) long, almost half of that tail, and weighs from 0.7 to 1.8 kg (1.5 to 4 lb). That is about four times the weight of the brown rat (Rattus norvegicus), though an adult muskrat is only slightly longer. Muskrats are much smaller than beavers (Castor canadensis), with whom they often share their habitat. Adult beavers weigh from 14 to 40 kg (30 to 88 lb). The nutria (Myocastor coypus) was introduced to North America from South America in the early twentieth century. It shares the muskrat's habitat but is larger, 5 to 10 kg (11 to 22 lb) and its tail is round, not flattened. It cannot endure as cold a climate as can the muskrat and beaver, and so has spread only in the southern part of their ranges in North America. Muskrats are covered with short, thick fur which is medium to dark brown in color with the belly a bit lighter. The fur has two layers, which helps protect them from the cold water. They have long tails which are covered with scales rather than hair and are flattened vertically to aid them in swimming. When they walk on land the tail drags on the ground, which makes their tracks easy to recognize. Muskrats spend much of their time in the water and are well suited for their semi-aquatic life, both in and out of water. Muskrats can swim under water for 12 to 17 minutes. Their bodies, like those of seals and whales, are less sensitive to the buildup of carbon dioxide than those of most other mammals. They can close off their ears to keep the water out. Their hind feet are semi-webbed, although in swimming the tail is their main means of propulsion. While most muskrats have brown fur, some with reddish brown, a black muskrat variety lives in the New Jersey and Virginia region. Its fur is nearly black, with light gray under belly. Most of these muskrats inhabit marshes near salt water, although some have been trapped in fresh water lakes. Muskrats, like most rodents, are prolific breeders. Females can have 2 to 3 litters a year of 6 to 8 young each. The babies are born small and hairless and weigh only about 22 grams (0.8 oz). 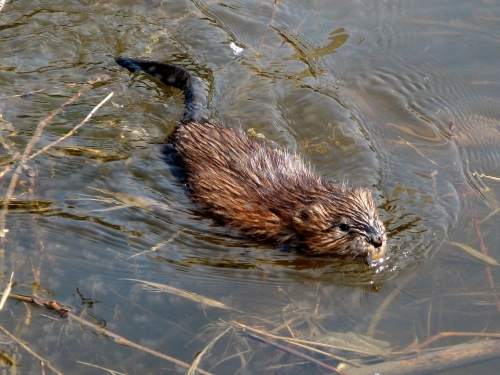 In southern environments young muskrats mature in 6 months, while in colder northern environments it takes about a year. Muskrat populations appear to go through a regular pattern of rise and dramatic decline spread over a 6 to 10 year period. Some other rodents, including famously the muskrat's close relatives the lemmings, go through the same type of population changes. 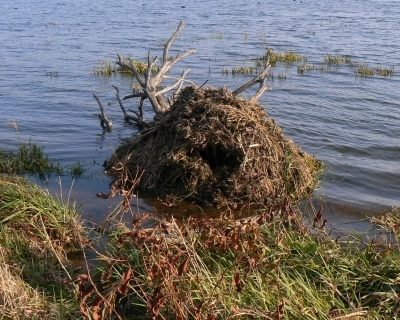 Most muskrat damage is caused by their burrowing. They burrow into earthen dams, dikes, levees, and railway embankments, weakening their structures. They also burrow into the banks of ponds, canals, and irrigation and drainage ditches. Their tunnels may drain a small farm pond. 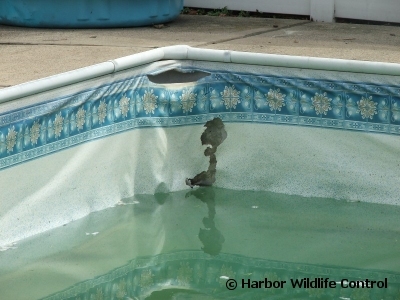 They may damage swimming pools, floating docks, marinas, and boathouses. Muskrats will cross yards. Some people are frightened of them, or mistake them for Norway rats. Occasionally eat field crops. May cause substantial financial losses in states with major rice and aquaculture operations, because they eat rice, cut it down to use as building material for their lodges, and damage the field by burrowing through levees. Damage aquaculture sites by burrowing into levees or pond banks. Damage ornamental aquatic gardens by eating water lilies or cattails or other plants. When their populations grow too high, they may "eat out" all of the aquatic plants in the area, reducing the quality of the habitat for other species, such as waterfowl. Disease risks include tularemia, hemorrhagic septicemia, leptospirosis, salmonellosis, ringworm, pseudotuberculosis. They are hosts for many ticks, mites, fleas, and various worms.